Among my favorite Superman stories of the last decade have been Geoff Johns's abbreviated Action Comics -- action-packed, emotional, full of Superman's aspirational spirit, and with a smart take on Superman's supporting cast, too. 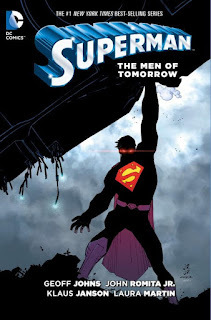 So I looked forward to Johns's newest short stint, collected in the (now-unnumbered) Superman: The Men of Tomorrow, mitigated only by my hesitations about John Romita Jr.'s artwork and rumors about some of the wilder changes this book makes to the Superman mythos. I came away from Men of Tomorrow very pleased. Johns again has good control of Superman as a modern and yet unironically heroic character; Lois Lane takes a backseat this volume, but Johns does solid work with Perry White and Jimmy Olsen as well. Though indeed mythos-changing, this is a largely done-in-one Superman story that doesn't require much foreknowledge and offers but does not demand the audience follow it into the next book, making it right for vacation reading or a casual reader. Johns's story deals in parallels and dopplegangers to explore the title character's mythology, as is often the case, but he does so as well as always. Romita's art grew on me the more I read the book, and I'm happy to see him continue into the Gene Luen Yang run that follows. For what is something of a placeholder story before Convergence, Johns acquits his Superman work well once again. Johns begins the book with an escape-from-Krypton-esque sequence in which human scientists save their baby from an explosion by sending him to the "Fourth Dimension"; that child, Ulysses, returns to Earth as an adult, supposedly surprised to find it hadn't been destroyed. Just as Clark Kent is feeling isolated and missing his late parents, he's able to both find a kindred soul in "the Great World"'s hero Ulysses and to reunite Ulysses, nee "Neil," with his own human parents. At some point, what seems will be the book's conflict is alien-but-human Superman's faith in humanity and their ability to make peace, not war, versus human-but-alien Ulysses's belief that humanity can only be saved by starting over in the Fourth Dimension. This is, in and of itself, worthy and not uncommon Geoff Johns Superman material, with Superman as a symbol of unending hope and potential confronted by someone who, under almost the same circumstances, sees the worst in humanity instead of the best. Over in the Fourth Dimension, however, in a relatively Star Trek-ian twist, Superman learns instead that Ulysses intends to sacrifice the six million humans he's recruited as a power source to prevent the Great World's imminent destruction, as he's done with other species countless times before. Ulysses, and Johns, now present this to Superman as whether he'd do anything to have saved Krypton just the same as Ulysses would do anything to save the Great World. But the comparison is flawed; as the Great World is Ulysses's adopted planet, he's "doing anything" to save his people the same as Superman might "do anything" to save Earth, not Krypton. (Superman demurs, of course, though there's an interesting comparison to be made between Johns's take here and the pseudo-genocide Superman commits at the end of Scott Snyder's Superman Unchained.) Ulysses emerges not as a version of Superman who's lost his hope, but who's less "human," in moral terms, than the Kryptonian Superman is. In the fraught climax, Superman -- trying to prevent the destruction of one if not two sentient species -- offers that an entire planet of aliens can simply come live on Earth until they find another planet for them. It's such an out-there idea, completely ridiculous even before one considers the numerous mass murders these aliens have committed, but I liked how Johns ramped-up the sci-fi elements toward the book's end, and also the suspenseful desperation he portrays in Superman, trying essentially to prevent the destruction of another home planet. If there's one flaw in Johns's conception of Ulysses's overall scheme, it's that Johns identifies that it's "six million" people who will die, a number most commonly associated with the Holocaust, but used perhaps too blithely here given that Ulysses doesn't work as a Hitler analog, etc. I admit to being not at all familiar with John Romita Jr.'s work prior to this collection, and again I had some concerns based on the individual issue's covers, which often seemed to have distorted characters and to be too plain, lacking backgrounds. But the interiors are delightful, especially in Romita's depiction of the young, sedate, recognizable Clark Kent. His action sequences are more abstract, with Ulysses's infinitely-long hair for instance, but this is balanced by the normality elsewhere. Ultimately what I like about Romita's broad, sketchy work is how different it seems from DC's house style, and frankly I hardly imagine Romita's art as conforming to the Marvel house style, either. Were Romita simply a new "DC You" artist meant to break the mold, I think I would have "gotten" his style sooner, but regardless I'm happy to see him continuing on Superman. I don't favor the "super-flare" superpower that Johns introduces for Superman -- among other things, I don't know that it says "Superman" to me that he can be human for a day essentially at will -- but neither does Johns make it a power Superman has to use (and that other writers could ignore), so I don't see the harm. And neither can I much tell the difference between Superman's "old" New 52/Jim Lee armor costume and John Romita's new one; it's not as though Romita brought back the underwear. That Jimmy Olsen knows the secret now is a larger (or at least less avoidable) change, but one, too, that I can see easily undone (as the entire upcoming "Truth" storyline will one day be undone). Johns makes Clark telling his secret to Jimmy logical in the context of the story and the themes of Superman's loneliness (and Johns even offers emotional basis for Clark's sudden departure from the Daily Planet under writer Scott Lobdell, too), so in all my concerns about these changes were assuaged by the end of the book. Fans of Geoff Johns's Superman before ought be fans of his Superman now; Superman: The Men of Tomorrow doesn't unseat Superman: Brainiac or Superman and the Legion of Super-Heroes among my favorite of Geoff Johns's Superman works. But, it's fine and approachable as a Superman "special" or graphic novel, and with less ambiguity to it than Scott Snyder's Superman Unchained, which is sometimes what you want in a Superman story. Men of Tomorrow in many ways serves to reset the Superman status quo before the post-Convergence era, and if this is a taste of things to come then I'm looking forward to it. I enjoyed this run, especially the epilogue issue, but I'm frustrated that Johns didn't stick around so he could at least finish the Mr. Oz storyline, which apparently has joined "Rise of the Seven Seas" as one of the teased stories he'll hopefully get to tell in Justice League, unless he decides to leave that book earlier than he should. Again. As for Romita, I have to admit I really didn't care for his art when I started reading comics in the mid-'90s, and he had just started his second run on Uncanny X-Men. It was only when he did Thor with Dan Jurgens that I started to appreciate the sheer energy and bombast of his artwork, and that's just what he brought to Superman. Indeed a place this book fell down was in the Mr. Oz storyline, but that was ultimately so aside from the main plot (and the main plot was so good) that it barely registered as a sour note. I thought that this vaunted package the villain sent to Clark was ultimately a blank book was a little silly, and smacked too much of a moral to the story than a plot item (or further, it could be a metaphor for the further adventures of Superman being wide open for new writers, etc. ), but coming as it did at the end, I took it as "to be continued" fodder that, who knows, maybe will be "continued" one day.